High Performance Protection From Covercraft SnapRing TireSavers Sold in pairs (2 per set), TireSavers are available in White or Black. Measure across the tire for size, there are 7 sizes to fit all from small trailer tires all the way up to large motor homes. 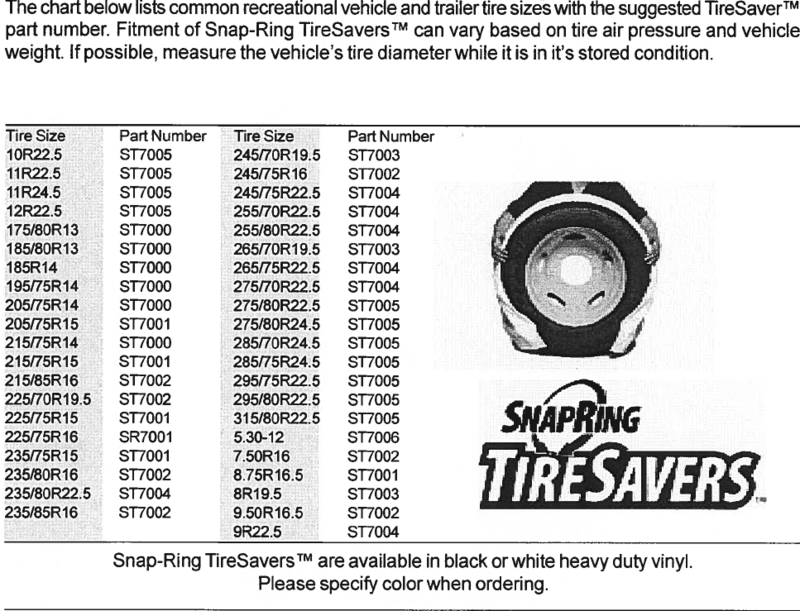 Better Protection for Your RV Tires SnapRing Tire Savers From Covercraft. Anyone who stores a trailer, motor home, car, truck, SUV or any other vehicle with rubber tires, is familiar with the damage caused by the sun's heat and UV rays. Tire dressing products will make the rubber look good, but don't provide adequate protection from the elements. Covercrafts Snap Ring Tire Savers will protect your tires against the suns uv rays, heat, dirt, dust, acid rain, animals, pets etc. They are easy to store and can be used on short road trips. Covercraft Snap Ring Tire Savers are made with a heavy duty, flannel backed vinyl that protects your tires and wheels.